The Montessori House School » Blog Archive » Bunny Kindling in the Classroom! « CLOSED: Wednesday March 21st due to snow. Bunny Kindling in the Classroom! Yesterday our mother rabbit (a.k.a. 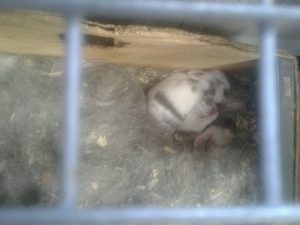 a rabbit doe), arrived with five baby bunnies (just 7 days old! a.k.a. rabbit kits — short for kittens ). They’ll be in the classroom for about 30 days, so the children can watch them grow! In 30 days they’ll be quite large. 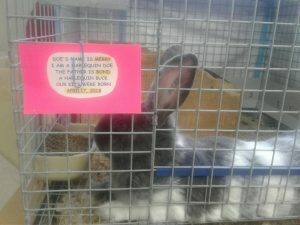 These are Harlequin rabbits — the mother is named Merry, and the father (a rabbit buck) is named Bond. This litter was born on April 17, 2018. Merry is about 15 inches long (longer when she stretches out), the babies are about 3 inches long. This entry was posted on Wednesday, April 25th, 2018 at 3:22 pm	and is filed under School News. You can follow any responses to this entry through the RSS 2.0 feed. Both comments and pings are currently closed.